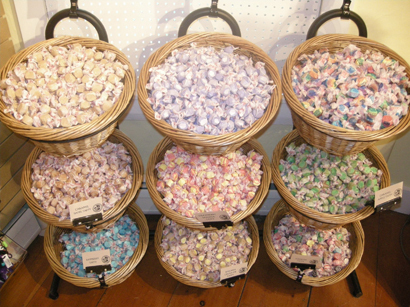 Create your own wall of candy with one of these 9 Basket Wicker Display stands! This freestanding floor fixture offers an exciting way to show off bulk wrapped candy, stuffed animals or toys, various cosmetics, small hardware, craft items, plus so much more. 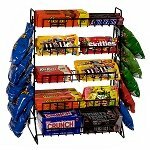 With nine storage containers attached to a sturdy and dependable metal rack, you are sure to increase buying. Cross merchandising materials is a great way to help and make suggestions to your patrons. 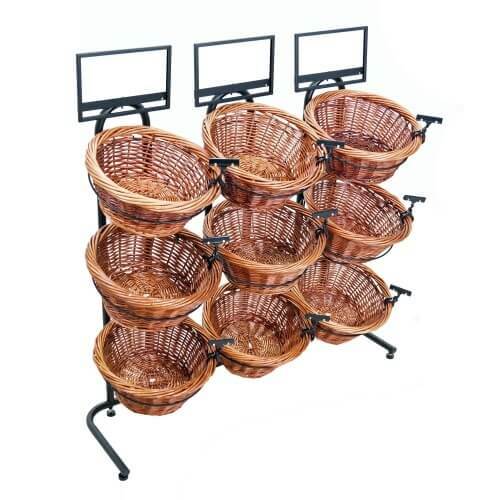 Great for any retail environment, this wicker basket system will be the center of attention in your store. 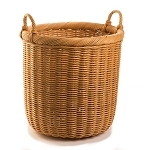 Gorgeous wicker baskets bring that natural element and decor to your shop. If you are interested in this same setup with lovely two-toned baskets, we carry those as well. 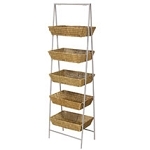 Need a smaller or larger basket display? We have from a Three Basket version to a 12 Basket one. Order your retail wicker displays today! We need to upgrade our containers for the plastic dinosaurs that are so popular when visitors come to MOR. These were just the perfect side and actually allow us to display more dinosaurs and it looks so much better and I think easier for people to see what is available.